The Culper Ring has remained intact through 1780, but it may not last another year of the war. 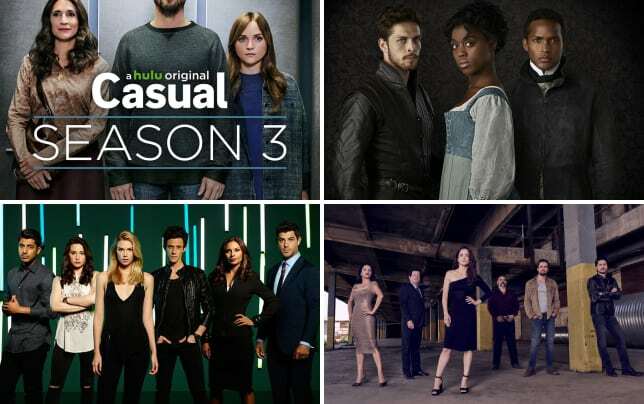 On Turn: Washington's Spies Season 4 Episode 1 and Turn: Washington's Spies Season 4 Episode 2, Patriot traitor Benedict Arnold teams up with another villain in order to hunt down every loyalist spy and break up the ring for good. When we left off last season, Arnold had successfully joined the Brits and married his dream girl. Now he calls himself a Spyhunter General (oh how he wishes history would equate his name with capturing spies instead of treachery) and uses Col. Simcoe to do his dirty work. Arnold lives up to his nickname, as Patriot spies are taken into custody one by one. But the elusive Culper (farmer Abe Woodhull) seems to be loving anonymous life in Setauket without masochistic Col Simcoe threatening everyone in town. Abe has renewed his relationship with his father, and he is so much more relaxed now that he and the Judge are on the same side. In fact, in the best part of the episode (the series maybe?) is the reemergence of the old pre-revolution father/son dynamic without all the stress of war. Permalink: I'm not letting you do this alone. In reality, Abe should still be very stressed. While he’s building himself a beautiful new home, the war rages on and Simcoe is wandering the streets of New York. Speaking of New York, the first episode dragged a bit during the Peggy/Philomena storyline. Sidebar: Before she was taken away as a suspected spy, Philomena got to do something we all wish we could do – wait until the next day to deliver a snappy retort as if the moment hadn’t passed. She was unable to think of a response to Peggy at the party, so she waited to confront her on the street a day later and deliver her clever comeback. I doubt she thinks it was worth it, though, as Peggy’s actions proved louder than words. I felt bad for Pegs last season when Andre was executed, but I’m back to loathing her again. She still thinks she’s involved in an epic love triangle (rectangle?). Major Andre’s dead; move on. She proved once again that she’s a superior spy, though, by manipulating her spy-hunter hubby into taking out her enemy. Was he talking business with Col Cooke while he did his business in the middle of the hallway? Was Cooke urinating into a chamberpot? Or was that just a random gravy boat? And did he hand the chamberpot to Arnold when he was done? Even in 1780, that was considered rude, right? I barely heard what they said during that scene because I was trying to figure out what was happening, but I’m guessing Arnold insisted that he’s important and deserves respect. Back in Washington’s camp, Anna has set up a trading post, but she’s struggling to find her place in the Ring. Another unexpected, sadistic romance emerged in the second episode between Caleb and Col. Simcoe. I'm impressed. Most men would have begged for mercy by now. Permalink: I'm impressed. Most men would have begged for mercy by now. Simcoe has truly turned into a comic book villain, complete with a childhood trauma-laden backstory. Did Simcoe’s revelation about his father remind anyone else of the Dark Knight Rises (I think?) when we find out about Bane’s awful childhood? You are a two-faced, pompous piece of shite. Permalink: You are a two-faced, pompous piece of shite. I love Caleb (please don’t kill off Caleb!) and winced all the way through those terrible torture scenes. While I think Simcoe is an evil genius, I don’t think he could have figured out the entire Culper Ring after a single Caleb chortle. 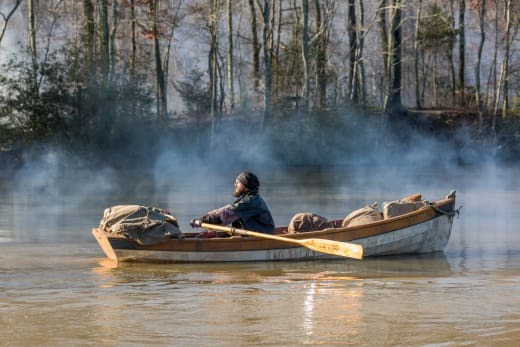 Hopefully, the Woodhull boys can figure out another way to rescue Caleb. Before we go, yes, I do already have a favorite scene this season. George Washington being absolutely fascinated by a giant spork after declaring that the war is nearly lost was my pick. What's yours? 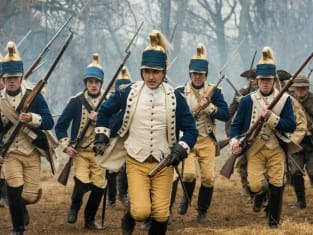 Do you think Turn: Washington's Spies Season 4 is off to a good start? 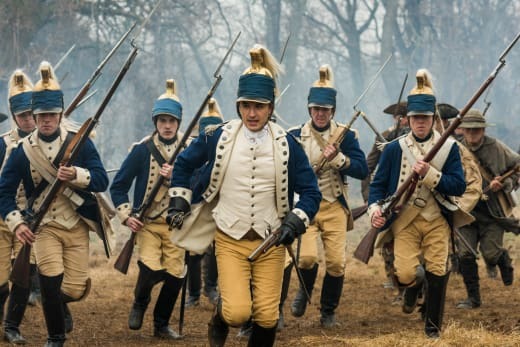 We’re already two episodes in, so catch up and watch Turn: Washington's Spies online. Ah, General. The red really does suit you. Permalink: Ah, General. The red really does suit you. Permalink: His name is Brewster.